Elite Sublimated Uniforms on Sale. Logos, numbers, artwork and players names are dyed directly into the fabric to eliminate excess weight and enhance your performance. Guaranteed never to crack, peel or fade. Shoulders are reinforced with cotton tape to add durability and prevent stretching. Necks are taped for a more comfortable feel and richer look. Sleeves are cover stitched around the arm hole to give you extra strength and durability. 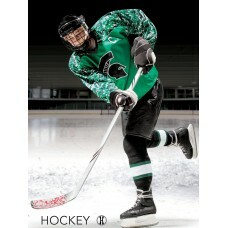 You can choose from a wide variety of sublimated designs for a unique and personalized uniform. Trim is stitched for increased durability. Binding around the arm hole is set on with a machine to lay flat & give you durability, comfort and stretch without breaking top stitches. Minimum quantity 6 pieces per style & color scheme. Price includes sublimation of name, logo, front & back number, development and application of artwork, any number of colors. Please allow 3-4 weeks production time after approval of artwork. No artwork or screen charges. Individual player names sublimated on back of jersey add $8.00 per jersey. Minimum fill-in 2 pieces. If you don't have 3 weeks, call about our sublimated hockey jerseys in 7 working days, or try stock hockey jerseys.